Potato gnocchi is a personal favorite food. When I go out to eat at a new Italian restaurant, my eyes are almost immediately scanning for these delicious little dumplings on the menu. 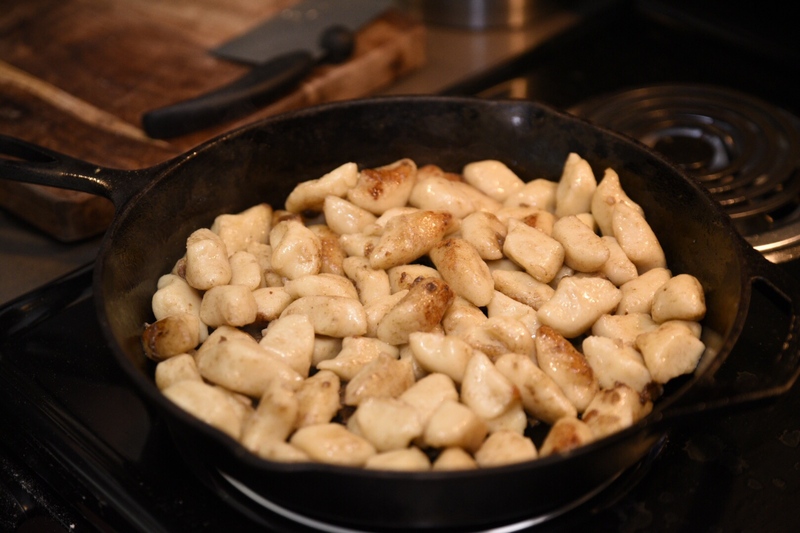 The quality of the gnocchi, to me, is the crucible which makes or breaks an Italian kitchen. When they are done right, they are like fluffy little pillows seemingly made from the clouds the Angels perched upon. The sound of little golden harps can be heard ever so softly. They can be that good. When they are done wrong, they are dense, chewy little bags of potato that evoke rubber. The sauce is, to me, secondary. The true test is in the gnocchi themselves. Luckily, Potato Gnocchi (pronounced Knee-yo-kee) are actually pretty easy to make at home. Compared to the making of any other pasta especially. So, here is how I have found to get decent results. Three large russet potatoes – This is important, gotta go russet on this one. They will bake up fluffy and soft. Ultimately yielding a lighter fluffier dumpling. That’s it! Less is more on this one. This is important. It takes longer than say, boiling, but it helps to dry the potatoes and keep the fluffy insides separate from the skins. Preheat your oven to 450, and generously sprinkle some coarse salt on your baking tray. The salt will help to draw more moisture out from your spuds as they cook. Don’t forget to pierce your potatoes with a fork, 3-4 times per side to let the steam escape. Throw them in for an initial 45 minutes and give them a gentle squeeze. If they give easily, yank ’em out at this point, otherwise leave them in for another 5-10 minutes. Let your potatoes cool off for about 10 minutes and then cut them in half and scoop out the insides with a spoon. For best results, you will want to run them through a potato ricer. This really does make a big difference. Sure you could just mash them, but you would be compressing the potatoes and pushing the air out of them, leading down a one way lane to rubberville. I picked mine up on Amazon for under twenty bucks. It’s worth it, trust me. So, you should end up with a nice big pile of potato that weighs about 1.25 pounds. If you have more or less, don’t panic. Make a bowl shaped indentation in your pile of spuds and crack both the eggs into it. Then lightly sift a cup (more or less depending on your quantity of potato) over the whole thing. It helps at this point to be listening to some old Italian guy singing opera. Especially if you, like me, don’t really care for opera music at all. The reason why will become apparent in the next step. Take your hands and get in there. Dive in, but gently. You want to work the pile into a dough that just holds together. It will be sticky and it will cling to your hands, but avoid the temptation to work the dough into something smooth and uniform. You want to avoid working the flour too much and creating a bunch of gluten. If you feel as though it is too sticky and you can’t roll it out into a long rope, sprinkle some extra flour on, but very sparingly. This is where you can stop the opera, which hopefully has limited the amount of time you spent kneading and thus, helped immensely. Go ahead and rinse your fingers off and prepare the surface with some flour dusting to roll out the dough. Top off your wine glass, because you are drinking wine at this point, right? Divide your dough into two and roll out on a lightly dusted surface. Try to keep the rope even and go for 1/2 inch in diameter. The wider the rope, the bigger the gnocchi will be. For cream or tomato sauces, I go smaller, for sautéing in butter and sage, I go a little bigger like 3/4 of an inch. Once rolled out, take a knife or dough scraper and cut the ropes into little pillows, about an inch in length. Now the proper Italian way to finish the gnocchi is to use the back of a fork or a (wait for it) Gnocchi board to create little ridges on each pillow. I’ll be honest, I rarely do this unless I’m putting them into a creamy sauce and want a little extra surface area for the sauce to stick to. For style points, definitely go for it. It can be pretty time consuming, so good thing you topped off that vino. Gently drop the gnochhi into your water at a rolling boil. Then wait a few minutes for the magic to happen. You’ll know it has when the gnocchi are floating on the surface. Not just rolling up with the boil, but staying up at the surface. Use a slotted spoon to remove them right away and add a few more from your prepared pile of uncooked gnocchi. If you have a sauce ready to put them in, do so at this point, if you will be using them later on, toss them lightly with oil in a large bowl to prevent sticking. Potato Gnocchi can be paired with almost any cream or tomato based sauce, although I like mine to be sautéed in butter with a dusting of sage and Parmesan or Asiago. That’s it! Enjoy the fruits of your labor and prepare yourself to get judgey the next time you order off an intalian menu. After all, you can create a perfectly fluffy masterpiece, so…. Much love and appreciation to my beautiful girlfriend Stephanie for being my hand model and making me the delicious Gnocchi pictured here. Thanks for your interest in cooking with us.